Needs to be updated with ESO: Murkmire information. 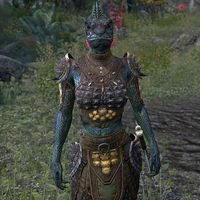 The Nagas are a little-known breed of Argonian that live in the deep parts of Black Marsh. Nagas have some distinct differences in their appearance compared to the Argonians most commonly seen throughout Tamriel. They are described as having "huge mouths filled with dripping needle-like fangs". Nagas are described as standing from seven to eight feet tall, but appear to be of average height, and are called 'puff adders', suggesting snake-like features. When Imperial interests were attempting to maintain plantations in Argonia, the Nagas generally acted as highway robbers; however, following the cessation of these efforts, they have since left the roads and have gone back into the inner swamps. The Naga-Kur (or "Dead-Water Tribe") of northern Murkmire control much of the inner swamps. Unlike the tribeless Nagas that inhabit the region, the Naga-Kur are proud warriors, deeply entrenched in tradition. They are hostile to outsiders and feared by neighbouring tribes because of their brutal ways. A prerelease version of Tribes of Murkmire: Ghost People described the Naga as similar to serpents, frogs, or "cuddlefish". The current version of this book does not include such references. This page was last modified on 2 April 2019, at 14:01.